Gutter Knight Sydney supplies and installs high quality leaf guard to suit all types of foliage, roof types and heights we cover the lot. We have a variety of apertures (hole sizes) ranging from 2mm through to 5mm so have the perfect solution for your Gutter Guard requirements. When quoting for you, we will suggest the most appropriate gutter mesh for your job taking into consideration all the surrounding tree types, type of roofing and guttering material, if bushfires are a potential risk and also if there is a water tank in use. Prior to gutter guard installation we thoroughly clean out all of your gutters and valleys to ensure they are clean of any leaves and debris before installing your gutter protection. Another added benefit is all our gutter protection mesh is powder coated to suit the colour of your roof and a matching metal trim for the gutter also, meaning your gutter mesh will not be obtrusive and will blend into your roofline. 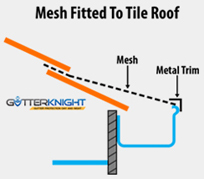 Gutter Knight supplies and installs a variety of gutter mesh for all types of tile roofs, whether it be decramastic, concrete or terracotta. We are able to install and protect all your gutters and also the valleys from leaves and debris. Our gutter mesh is installed and secured up under the front of the base of the second tile and then secured to the front of the gutter edge by using galvanised steel screws and a metal angle trim forming a totally sealed area. When installed the gutter guard mesh has a downward slope over the outside edge of your gutters which acts like a ‘ski-slope’, this makes it easier for debris and leaves to simply slide off or be blown off the roof by the wind. 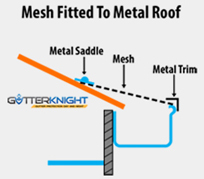 Gutter Knight supplies and installs a range of gutter protection mesh to suit all metal style roofs including Corrugated, Trimdek, bullnose (on verandas) and other types of metal roofing, also we provide protection for the valleys. The gutter mesh is secured to the roof using metal ‘saddles’ (not silicone) that are held in place with galvanised self sealing rubber topped screws which places downward pressure on the gutter guard mesh to ensure it is secure and tight against the roof so leaves and foreign debris cannot get under the mesh. The other side of the gutter mesh is secured to the gutter edge again by galvanised screws with a metal trim that forms an enclosed area that easily lets water in but keeps debris and leaves out. This again acts like a ‘ski-slope’ as leaves just slide off or blow off with the wind. All fittings and mesh used are powdered coated to suit the colour of your roof and gutters, to provide a seamless and neat look. Our 2mm All Steel Mesh meets all new Australian Standard requirements for Ember Guards for all bushfire attack levels – check with your local authority to see what applies to you. We take safety extremely seriously. If a roof is deemed to be unsafe or dangerous due to roof / structural damage etc we will not work on it. For all Commercial jobs we provide written SWMS (Safe Work Method Statements) and first perform Risk Assessments prior to starting these jobs. Our team all have their working at heights certification, carry roof harnesses and are trained in their use.